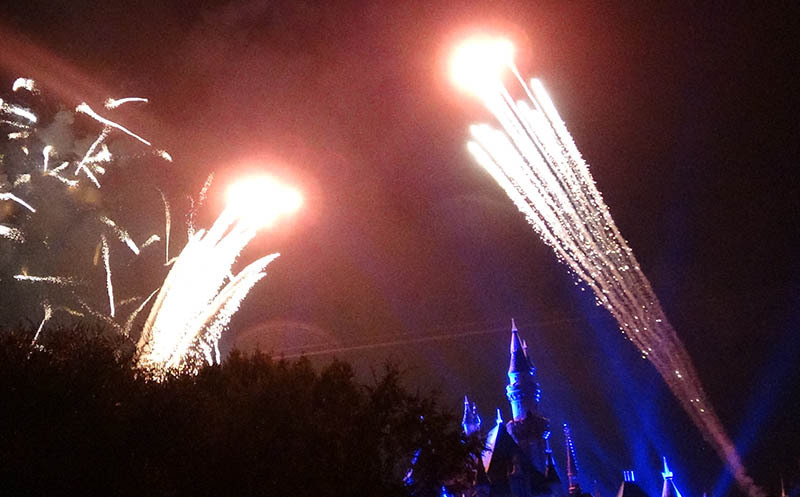 A spectacular Disneyland fireworks show, bringing dreams and Disneyland's classic attractions to life in the night sky. The Rememeber... Dreams Come True fireworks display was originally designed as a show to celebrate the 50th anniversary of Disneyland back in 2005 as part of the Happiest Homecoming on Earth commemorations. It ran until November 2014 when it was replaced by the Disneyland Forever fireworks show, before returning once more in February 2017. The show features a variety of classic Disney fairytales together with homages to some of Disneyland's best loved attractions. Julie Andrews narrates, inviting the audience to share in the spectacle of Disneyland - the park that was born out of Walt Disney's dream. A mixture of music, fireworks, lighting, lasers, fire and creative projection mapping are used to help tell the story over the approximately quarter of an hour running time. Tinker Bell makes an appearance too, flying out high above Sleeping Beauty Castle. The show's misty-eyed finale features Julie Andrews reminding the audience that Disneyland has grown to become the Happiest Place on Earth, a place where dreams really do come true.